The most decorated role player in NBA history pulls off the main roadway and into Liberty Park, near the court where crowds first came to see him work his game and dream his dream. Jamal Crawford unfolds his 6-foot-5 frame from the driver’s seat, casually trudges toward the back of his luxury sedan and pops the trunk. “Here you go,” he says, plucking one of four basketballs from a pile and flicking it to Jayen Jamal (J.J.), his 6-year-old son. Twenty years ago, Crawford would roll up to this park in Renton, Washington, just outside Seattle, in a used baby blue Oldsmobile Cutlass. Back then, he had two worries in his 16-year-old head: gas money and holding the court till dusk. Today, on a gray Saturday in mid-July, he’s driving a pearl Mercedes S63 AMG with a full tank, and his main concern is whether J.J. will stop with those crazy, Stephen Curry finger-rolls and just try a regular layup. Park. Grab a ball from the trunk. And let the metronomic rhythm of the ball pounding the pavement and the pffft of a pullup jumper piercing the thick cotton net take him somewhere else. From a misspent youth to NBA multimillionaire, the journey includes elements of mischief, misfortune and maturity at every stop. And lessons learned every time he opened the trunk and reached for that leather ball. Sixteen years. Seventeen head coaches. And roughly 600 crossed-up and shook peers, all outlasted by a sinewy Seattle kid with a game from the Church League gods, whose lifelong companions since boyhood were the basketballs he has taken everywhere since he was 3. Now 36, Crawford’s joints, limbs and rainbow release keep obliterating their expiration dates. The Los Angeles Clippers, which just signed him to a three-year deal that could pay him $42 million by the time he’s 39, have come to rely on his offense late in the game like they do with Blake Griffin and Chris Paul early. The ageless veteran with the herky-jerky, shake-and-emasculate game, nicknamed “J. Crossover,” didn’t last this long and drain so many buckets because he avoided bad decisions or bad beats. No. He’s had a litany of both. Jamal Crawford, 36, makes a phone call from within his family’s home on the edge of Lake Washington. Jamal Crawford, three-time NBA Sixth Man of the Year and one of the greatest role players in the game’s history, opens up about his life following a recent three-year, $42 million contract with the Los Angeles Clippers. “Did you ever imagine your little brother having all this?” Crawford said to Lori Skinner, one of his two older sisters, who helped raise him. “No, I guess I didn’t,” Skinner replied, smiling, taking in the Pacific Northwest panorama of greens and blues from her brother’s deck. This was in February, during the All-Star break, between forkfuls of waffles and bacon at Crawford’s gated Seattle home, a multimillion-dollar estate a few doors over from former Seattle Seahawks owner John Nordstrom and across Lake Washington from Seahawks owner Paul Allen’s compound. “I know, I know,” Skinner said. He nodded toward his sister. Six teams. Sixteen years. Seventeen coaches. A marathon of roster cuts and contract dumps. The times he was asked to subjugate his surreal ball skills, and eventually his starting job, for the good of the team. Playing on the big stage but often as a character actor, far from the Kia and State Farm commercials. Crawford endured because, well, coming back from down 20 is the most recurring pattern in his life. He ditched school until about 11th grade. Shot dice as much as he shot hoops. Ran with the wrong kids. Got robbed for wearing the wrong colors in gangland Los Angeles. And even when he finally achieved his dream and got to the NBA, he kept getting in his own way, doing the things knuckleheads do, throwing away money and opportunity. He also took to heart the saying, “Change is certain, growth is optional.” Every time Crawford’s environment changed, he grew with it. Adjusting, adapting, carving out a career and a life, as the ink on his right forearm reads, “Against All Odds,” he became the crossover chameleon, taking whatever form he needed to survive. 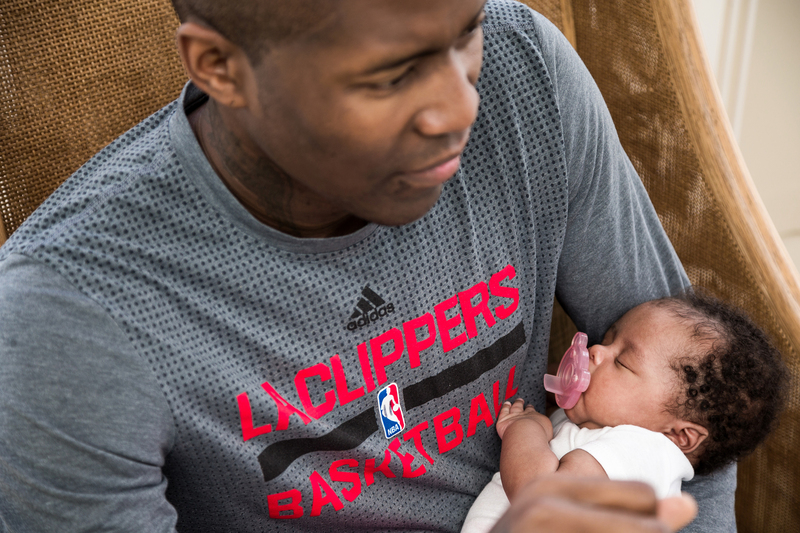 Jamal Crawford feeds his 5-week-old daughter Aerin at the family home on the edge of Lake Washington. Venora Skinner got pregnant at both 12 and 13 years old by two different teenage boys. She gave birth to her first daughter, Lisa, on her 13th birthday, Halloween 1966. Because her parents and extended family essentially raised Lori and Lisa, Venora Skinner was able to graduate from high school and put herself through the University of Washington, getting her bachelor’s degree in speech education, and later going into teaching and nursing. By the time she began dating Clyde Crawford, who played with Cleveland Cavaliers forward Kevin Love’s father at Oregon in the early 1970s, Venora Skinner’s girls were 14 and 13. Finally having a bit of her own life, she couldn’t imagine midnight feedings again when she found out she was pregnant with Clyde Crawford’s baby. Her first thought was not to have the child. 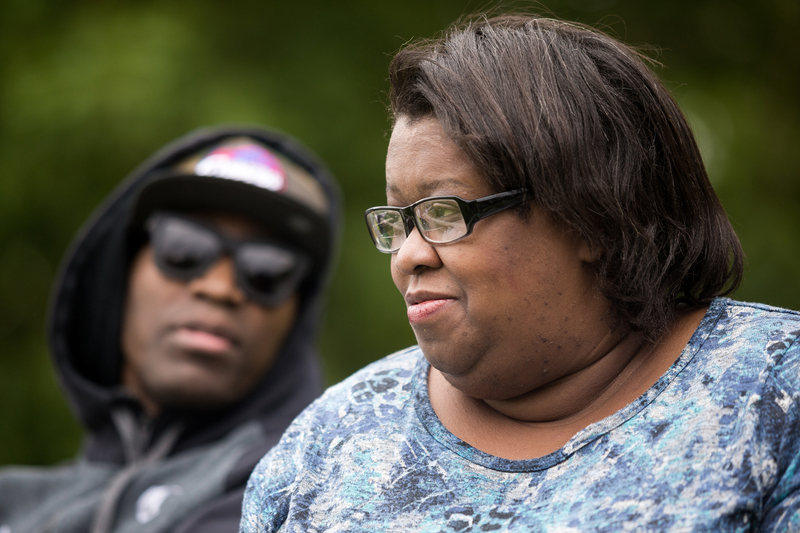 Sister Lisa Skinner (R) sits with brother Jamal Crawford (L) during a flag football game at Hazen High School. Lori just knew things would work out. See, Venora Skinner originally gave her second-born up for adoption. Venora Skinner obliged, and that child grew up to talk her adult mother into having one more child at 27. Although Venora Skinner doesn’t remember it exactly the same way, she notes that after the decision to keep the pregnancy, an accidental fall on black ice led to her losing amniotic fluid about two months before Jamal was born. She was on constant bed rest and her original prognosis for a miscarriage was 90 percent. But Aaron Jamal Crawford (his middle name came from Jamaal Wilkes, one of Clyde Crawford’s favorite players) arrived — long, spindly and healthy, if slightly blue. He instantly became the boy everyone wanted. Crawford thinks hard on it now. “As a kid, you don’t fully grasp it, so I was like, ‘Oh, thanks.’ Lori always looked at me like I was her son. It’s crazy, right, all the things that went into getting to this moment? 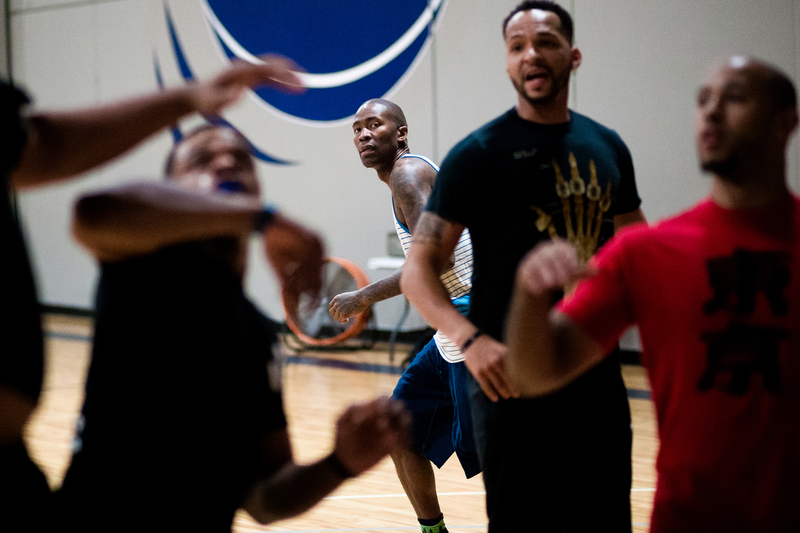 Jamal Crawford (C) takes part in an after-hours pickup game with friends and locals at the Eastside Basketball Club. The Almighty could not be reached immediately to either confirm or deny. But Crawford definitely was blessed with divine handle, a starter on any higher power’s All-Shook squad, alongside Allen Iverson, Pistol Pete, Skip to My Lou and now, Steph. He doesn’t dribble up the floor as much as hydroplane over it. The ball doesn’t belong to him as much as he belongs to it, the space between his fingertips and the orange leather acting as an invisible umbilical chord. They’re thisclose. He dribbled it everywhere. If he was with his mom, sisters or aunties on the way to the store, he went behind his back and between his legs down the sidewalk of Seattle’s Beacon Hill neighborhood — juking strangers, shaking ghosts with a spin or crossover. “People would walk down the street toward me and I would do a move on them. They’d look at me like, ‘He’s crazy,’ ” Crawford recalled. On plane flights to visit his father and grandmother in Los Angeles, “Jamal’s personal item and carry-on were his basketball and his NBA trading cards,” Lori Skinner said. Each time his family bought him a ball, it became his new security blanket. He carried it in his wagon, on his bike and, when he could drive, in his car. Even now, in the back of every luxury car Crawford has ever owned is at least one Spalding NBA leather game ball. Venora Skinner just wished her boy loved school as much as that ball. He wanted to hang with an older, rougher crowd. At 11, he was skipping school and coming home at midnight. Venora Skinner wasn’t having it. “Oh no, no, no, you gotta go with your dad,” she told him. “I can remember he used to talk s— to me about how he was going to be a pro,” said Aaron Goodwin, the uncle of one of Crawford’s childhood friends and Crawford’s first agent, whom he recently re-signed with. “When he was in the eighth and ninth grade, he used to challenge me to one-on-one shooting contests. Oh, he was so arrogant it wasn’t even funny. Crawford began shuttling between Seattle and Los Angeles, spending fourth and fifth grade in Inglewood, California, and returning to Seattle until his eighth-grade year. He didn’t want to leave his sisters and family again, but Venora Skinner insisted that her incorrigible son needed a male influence. 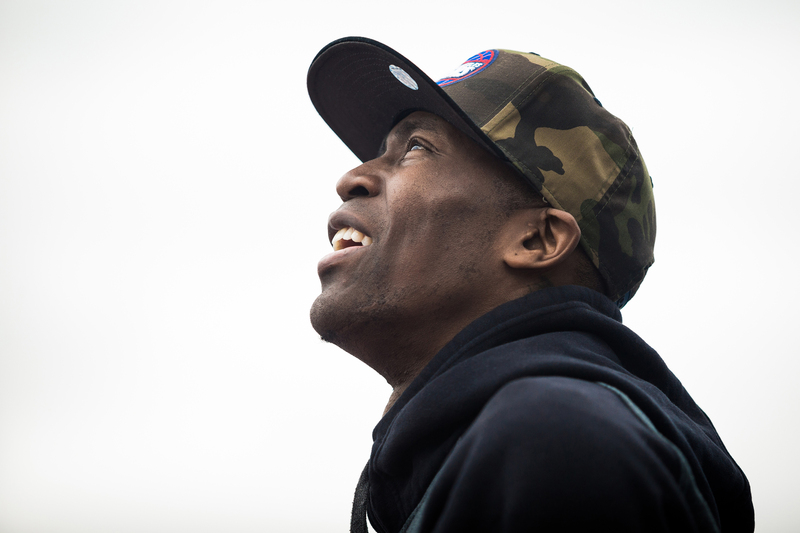 Jamal Crawford returns to the court where he became a known figure in the Seattle basketball scene, now known as the Jamal Crawford Court in Liberty Park. The bad decisions and occasional bad luck continued in L.A. He enrolled at his father’s alma mater, Dorsey High School, and soon after had a bracelet ripped from his wrist by the local Crips gang. Scared, he transferred to nearby Morningside, where his grandmother worked as a nurse. But he cut school there, too, and it wasn’t until a chance encounter with a future NBA teammate that Crawford began to realize the road he was headed down. The moment came circa 1996, as two prideful teens sat on opposite stools at a now-defunct barbershop. Pierce shot him a death stare before lighting the young’un up. It was as if Pierce had seen Crawford’s 10th grade spring semester transcripts from the Inglewood Unified School District: U.S. History: C-; Spanish: F; Chemistry: F; Geometry: D-; English II: F. Days absent: 17. Crawford wasn’t going anywhere without some semblance of academic achievement. He had caught a glimpse of the world he wanted to be part of, sneaking into the old Great Western Forum during Magic Johnson’s comeback in 1995 for a Los Angeles Lakers-Chicago Bulls game. As he walked around the floor, he was almost rubbing shoulders with Tupac Shakur, MC Hammer and L.L. Cool J. He so wanted that life. Now he needed to find a path to it. He called Lori Skinner and told her he wanted to return to Seattle and get serious about school. When his father and his grandmother rejected his pleas, telling Crawford he was just headed for trouble back home, he hatched a plan to run away. In the days before a laptop could print a boarding pass, his sister bought Crawford a one-way fare to Seattle and mailed it to his father’s address. He checked the mail before his father or grandmother every day until the ticket came. Because he didn’t want to tip them off, he buried a suitcase in the backyard two weeks before his scheduled flight. Rather than emptying his bureau drawers all at once, he got home each afternoon and painstakingly folded the clothes he had worn to school that day, went to the backyard and packed the suitcase, one outfit at a time. On the day of the flight, he dug up that little red suitcase, brushed off the dirt and got a ride to the airport from a friend’s parent. His sister was waiting for him at the gate as the plane landed. He left behind only a handwritten letter, dated July 5, 1996, which now sits in a scrapbook his father and grandmother gave to him last summer (along with the failing report cards, baby pictures of Jamal and yellowed newspaper clippings of Clyde’s and Jamal’s high school games from different eras). 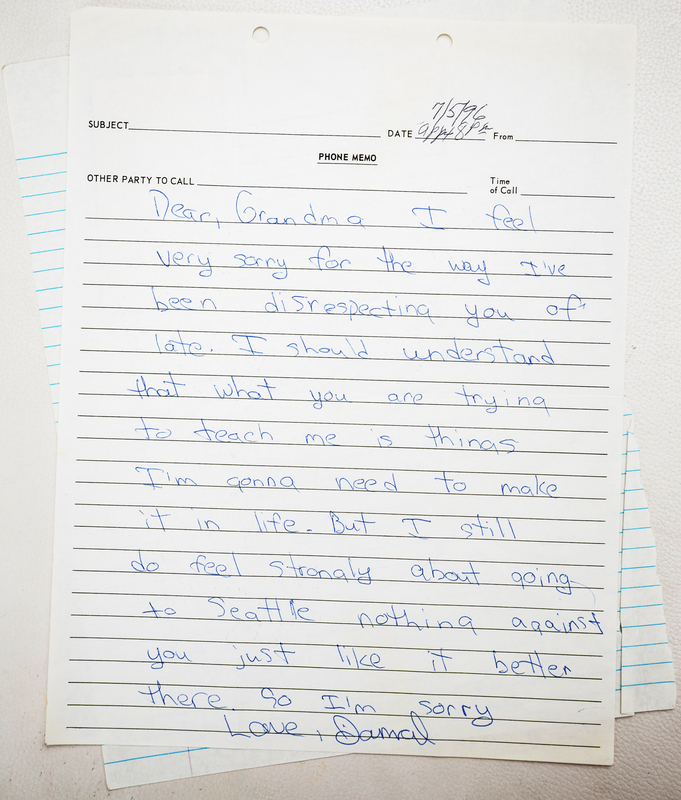 Dear Grandma, I feel very sorry for the way I have been disrespecting you of late. I should understand that what you are trying to teach me is things I am going to need to make it in life. But I still do feel strongly about going back to Seattle, nothing against you, I just like it better there so I am sorry. “I wouldn’t say heartbroken when he left, because I always knew God had his back no matter what,” Clyde says now. “But you think about what you could have did better. 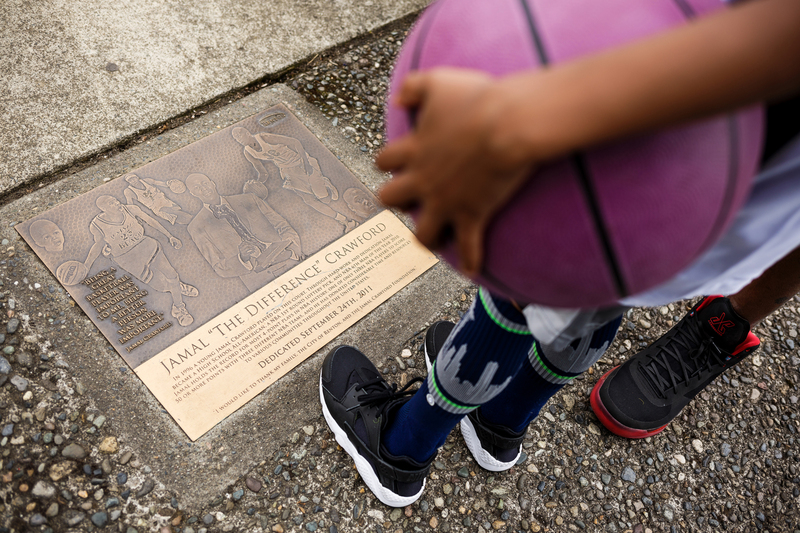 Jayen “JJ” Crawford, son of Jamal Crawford, looks down at a plaque dedicated to his father at the Jamal Crawford Court in Liberty Park. When he left Seattle for L.A. at 13, Crawford was a 5-foot-9, skin-and-bones eighth-grader. By the time he returned, he was a 16-year-old junior and had grown to 6-foot-4 on his way to almost 6-foot-6. He still had Wheat-Thin limbs, but his strength wasn’t an issue because his game had blown up. He began showing up at Liberty Park’s courts every day and playing late into the night. As he made grown men swipe in vain at his devastating crossover and destroyed the competition with a lethal mix of showmanship and ruthlessness, crowds of people hurried over, hovering along the fence. His game was a first-take mixtape: half Meadowlark Lemon, half Magic, all nylon. Seattle has reared a bevy of blue-chip guards over the past 20 years — Jason Terry, Brandon Roy, Nate Robinson, Isaiah Thomas. But no one made a gymnasium pulsate on Friday night like Crawford. No one had lines of people snaking around the building, waiting to see him glide and manipulate the ball with such elan. In his first year of organized high school ball, Crawford was the city and state player of the year and led Rainier Beach to a state title. By that summer he was among the top 100 recruits in the nation and going into his senior year he was named to Parade magazine’s All-America Boys Basketball Team. He had originally committed to Jerry Tarkanian at Fresno State, but with an extra year to accrue the credits needed for college, he changed his mind when Michigan began pitching him. Yet one hurdle remained. He needed a high enough score on the SAT to become eligible to play as a freshman. Despite a decade of resisting formal education, he finally approached school as seriously as basketball. This was it, the barrier between being just another schoolboy legend and a future pro. “The moment of truth — it could go either way,” he kept saying to himself. 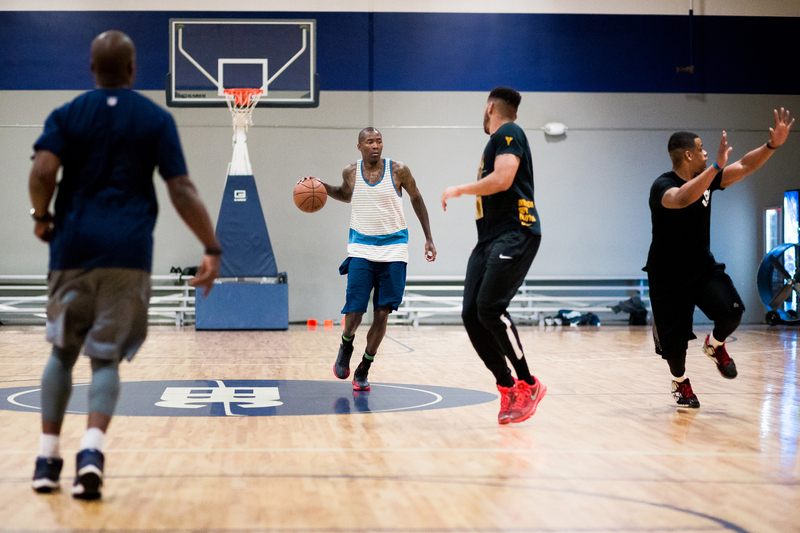 Jamal Crawford fades into a shot during an after-hours pickup game with friends and locals at the Eastside Basketball Club. Crawford worked with a tutor every day, studying for hours for the SAT. Life didn’t get easier when his high school girlfriend told him she was pregnant with his child. He asked his sister Lisa if she could get him a job at KeyArena, where she worked and the Seattle SuperSonics played. She obliged, and soon, to help support his infant son Eric, Crawford began bringing the popcorn and cotton candy up from the basement of the arena to the vendors, taking time once he got there to stand in the aisles and watch Gary Payton throw alley-oop passes for Shawn Kemp to dunk. He got up for class every day after getting home from work sometimes at 1 or 2 a.m. He studied math and reading comprehension with the tutor every day before work and took the SAT in the spring of 1999. He looked at the score, mouthed “I … passed,” and screams of joy followed — Venora, Lisa, Lori and Jamal, hugging, crying and laughing into the night. The truant with all that talent, who schooled so many kids on the floor, who could give himself every alibi imaginable for his academic woes, finally had buckled down for his own education. But even on the way to his dream, he had more stumbles. At Michigan, he dealt with two NCAA rules violations, including one for alleged benefits received from a guardian back home. He played in just 16 games and with not even a full year of Division I experience, declared for the NBA draft. 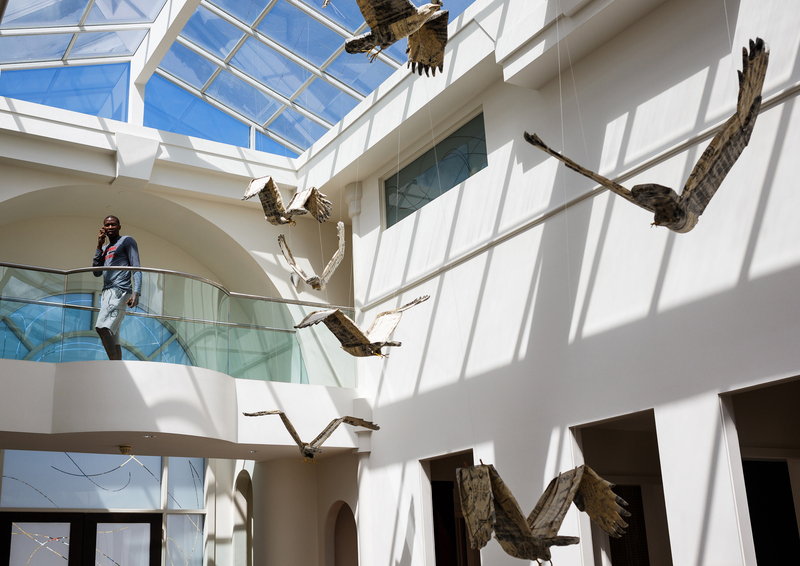 The wary eye of a Michael Jordan poster (L) keeps watch on Jamal Crawford (R) in Crawford’s office in the family home on the edge of Lake Washington. 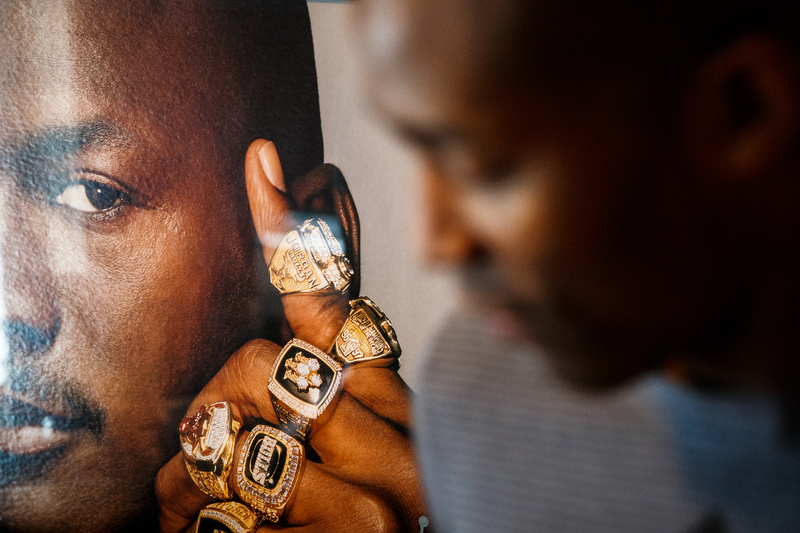 Cleveland took him eighth, and immediately traded Crawford to the Chicago Bulls — the team Michael Jordan, his childhood idol, made world-famous in the 1990s. Jordan asked Crawford to be part of a regular pickup game and workout crew during the summer of 2001 as Jordan investigated whether he would come back and play one final time. Crawford, just 20 years old, jumped at the chance to learn by osmosis the competitive fire of the game’s alpha male. In two years as Jordan’s teammate at Hoops the Gym in Chicago, he never lost a pickup game. Better yet, he was hanging with Jordan after hours, fraternizing with the legend. Some nights, he felt like he had a VIP pass inside the velvet ropes of a Monte Carlo casino. And that’s where old vices came back to bite him. In between Crawford’s first and second year in the league, after the pickup games at Hoops the Gym, many of Jordan’s friends and associates would go next door to his contemporary American restaurant, One Sixtyblue. After hours, games of chance were set up – Vegas-style card tables, a separate corner for shooting dice. Two participants, on condition of anonymity, recounted one particular night when Jordan and Antoine Walker were among the card players and Crawford and Ray Allen were among the players shooting dice. The game was craps, in which the shooter opens by rolling two die. Any combination other than “7” becomes the target to roll again. A “7” is considered crapping out, meaning the roll starts over and the money wagered gets collected. Crawford grew up on the game in the streets of Seattle and L.A. He’d won hundreds, maybe thousands, when he was a teenager. He brought about $2,000 in cash that night and remembers being one of the first shooters. There were maybe a half-dozen players, most of whom were professional gamblers. Crawford was up and down for a while, once holding about $10,000 in cash, more than he had ever won before. Then he went down. Way down. Into a hole there was no coming back from. He began making bets with money he didn’t have on hand with a group of professional gamblers used to getting paid on the spot. 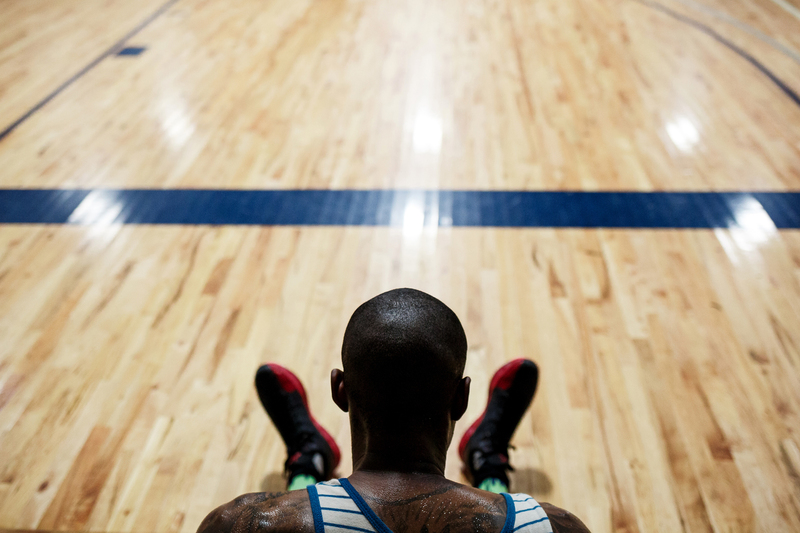 Jamal Crawford watches an after-hours pickup game with friends and locals at the Eastside Basketball Club. As the evening went on, Allen came into the game. He represented fresh cash and became the shooter. Crawford bet on his roll. And lost again. Both their losses piled up, and Allen had to borrow tens of thousands from Jordan, according to one of the participants. Over what is believed to be a two-day span, he said, he lost in the neighborhood of $100,000. A person with intimate knowledge of the game claims Crawford lost several hundred thousand and Allen lost even more. And that, days after the dice game, a call was placed to Goodwin, Crawford’s agent, to inform him that Crawford had not yet squared his debt with one professional gambler. Crawford swore he didn’t lose that kind of money, and said he never heard the story about his life being threatened. But he doesn’t deny he got in way over his head, which led to a particularly humiliating moment. To help square the debt at the end of the second night, he walked out to his 2001 Mercedes-Benz S Class 430, an immaculate new grey sedan. Before he handed over the keys, he opened the trunk of the car. And took out his basketball. Fifteen years later, Crawford said he has yet to shoot dice or even gamble outside of a legitimate casino again. “I played with Eddie Curry twice in Chicago and New York and I always remember him coming up to me after I got to New York and saying, ‘Man, who are you? You have matured so much from Chicago and New York.’ Like, I didn’t know better – about how to act, who to associate with. For me, it’s just amazing to see the growth. “When you ask how I survived, I think that’s it right there – I didn’t make the same mistakes twice,” Crawford added. “Do I regret losing that money? I mean, you never want to do that. But then the silver lining is, say I never did it, right? I’d be tempted now and I’d probably lose a lot more. 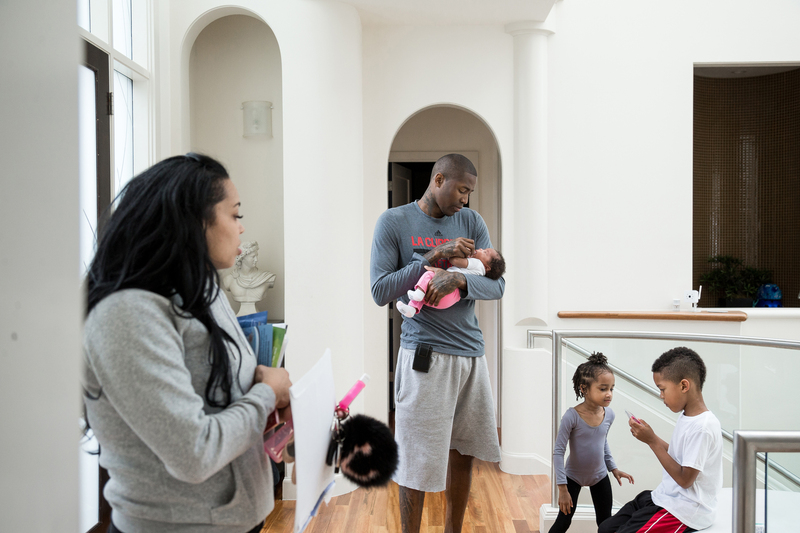 Jamal Crawford feeds his 5-week-old daughter Aerin, as wife Tori (L) and kids London, (center right) and son Jayen (R) look on in the family home on the edge of Lake Washington. His best decision, he said, came last summer when he wed Tori Lucas, his girlfriend of eight years and the mother of his three youngest children. They began dating 10 years ago, the classic girl-from-white-suburban Bellevue meets boy-from-South-End-of-Seattle tale – except the kid from Rainier Beach by then was a 26-year-old NBA millionaire who thought he was so slick he sent a friend over to ask Lucas for her phone number. They didn’t go out for another four months. Lucas took it slow, not wanting to be perceived as another NBA honey. But something about their second date made her think long-term. They met at Joeys, a popular Seattle haunt, and Crawford showed up in sweatpants and Nike slides with socks on. Lucas had dressed up. But when he sat down, they talked for nearly four hours — about family, about Crawford’s charities, everything. He wasn’t trying win Lucas over as much he wanted to tell her where he came from, how while growing up he was tugged like a wishbone between his mother and sisters in Seattle and his dad and grandma in Los Angeles. In time, she told him the two-parent-kid-from-the-‘burbs story wasn’t her reality — that her black father had raised her by himself, that she had never met her white birth mother. Crawford asked if she ever wanted to reconnect with her birth mother. “We gotta meet your mom, we’ll have her come out to L.A.,” he kept saying. She had little interest at first. But after having children of her own, Lucas felt the need to call. Her birth mother bought a plane ticket and they reunited in Los Angeles last year. They went to a Clippers game together. Lucas, 30, found out she had two half-sisters, 29 and 25 years old. Crawford’s role in their reconnection meant a lot to Lucas and their efforts to build their own family. Besides J.J., they have a 4-year-old daughter, London, and an infant daughter, Aerin. Two kids born into broken families, parenting together. J.J. is upstairs, making a racket bouncing the ball in the house, mimicking his father’s shoulder shake. Whenever Crawford tells J.J. that, no, he can’t take his basketball to the store or the movies, he ends up relenting, remembering another little boy who couldn’t be separated from his basketball. 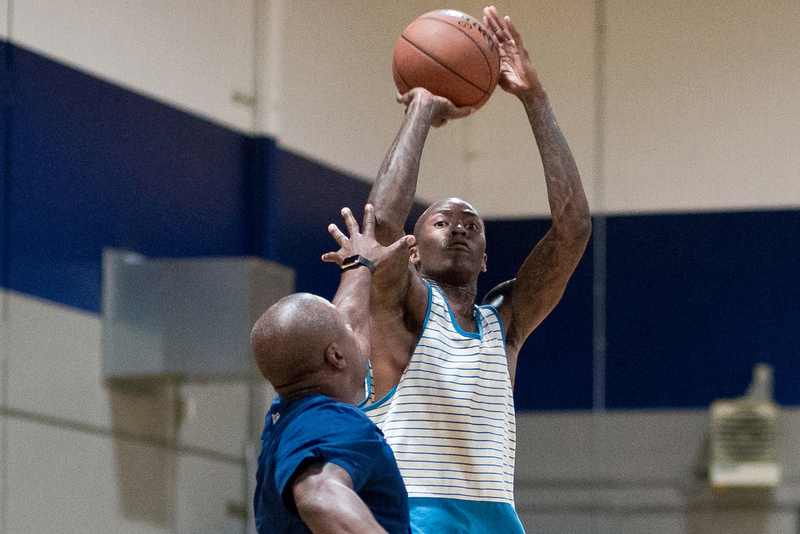 Jamal Crawford takes part in an after-hours pickup game with friends and locals at the Eastside Basketball Club. One of the advanced analytics yet to be quantified is Crossed Up and Badly Embarrassed. Crawford’s ability to discombobulate defenders – shake them so completely they often fall down trying to guard him – unofficially ranks somewhere between Iverson and Curry. “Here’s how it works for me: The first counter to the crossover is the fake crossover, where I do a little hang dribble and just keep going. The counter to that is the fake crossover pullup. I can switch it over to the other hand, and that gives me another three looks. So now I’ve got six moves off of one starting point. Then it’s about the battle inside the battle. Take away my left-to-right? OK, I’ll come back right to left. That’ll keep defenders off-guard. Oh, they’re sitting on that? Let me get the right-to-left-behind-the-back. Took that away? Let me put the right-to-left-behind-the-back-behind-the-back together. The real crime of Crawford’s career (other than the instability he couldn’t control, enduring so many organizations in transition that Doc Rivers is the only coach he’s ever had for more than one season) is that he was never invited to an All-Star Weekend. Not as a player whose numbers might have deserved it or as a skills competitor. How he lasted so long in a league that never took full advantage of his skills has everything to do with the survivalist in him. He was on a 15-67 Bulls team his rookie year, two 23-win New York Knicks clubs and never won more than 33 games in a season until his 11th year in the league. The Knicks moved him in 2010 because they wanted to enter the LeBron James sweepstakes. And when the Hawks finally got good, they didn’t have enough money to keep their new Sixth Man of the Year. Frustrated by the lack of appreciation for his game, even after 10 years in the league, he found a new hole to step in by going sideways with his agent. Goodwin felt Crawford was listening to the wrong crowd, hearing what he wanted to hear about his mad-skills game being disrespected by a homogenized league. He ended up getting another agent and signing a four-year, $21 million deal in 2012 that he had already outperformed by his second year of the contract. “Normally when I split up with someone, it’s because I’m not going to try to continue listening to the yes men in an athlete’s corner,” Goodwin said. “It’s kind of … if you look at where his career has gone, he’ll even tell you, that’s the problems that he’s had. “He’s realized what he can be,” Goodwin said. Still reinventing himself, Crawford came to the realization in Atlanta that America’s Role Player was going to be as good as it gets. The summer before the Hawks made him a reserve, Crawford sat out until the second or third pickup game every night in Seattle, growing impatient waiting to play until he gradually took to the role. “All of it, I can’t have regrets about it. It’s how I gained wisdom, learned the right things to do,” he said. “And there are the moments when you have to look at how far you’ve come to really appreciate your career. 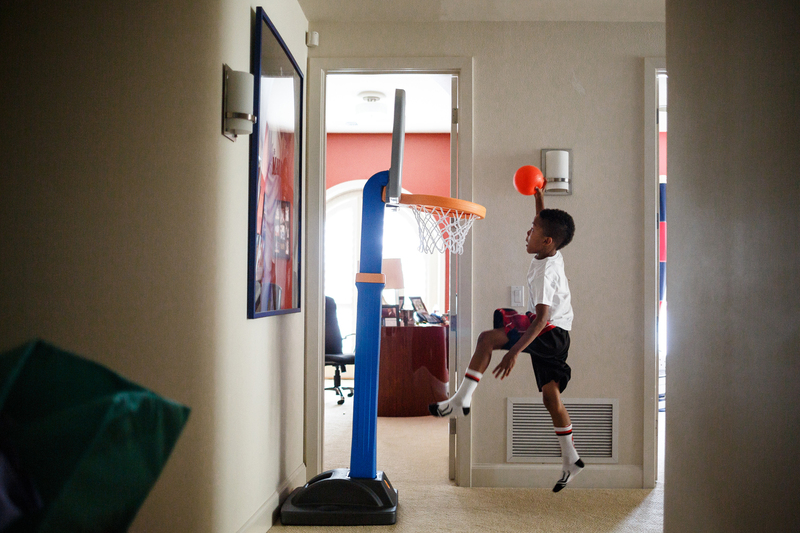 Jayen “JJ” Crawford practices ball on a kid-sized hoop at the family home on the edge of Lake Washington. “Uh-huh,” J.J. said, dribbling in for yet another missed circus shot. Crawford was just 18 when he first became a father, “which is just crazy, right?” said Eric Crawford, now 18 and with no immediate plans to have his own children. He talks to his father daily, about basketball, about life, whatever is racing through his mind. His mother and stepfather have a great relationship with Jamal and Tori, he said. J.J. was last here at Liberty Park when he was just a few months old. The marker set in red brick at the entrance to the court shows Crawford holding his infant son on the day it was dedicated in September 2011. Crawford gave the city of Renton $50,000 to put in new stanchions, lights and paint the courts. Today, it’s one of the best-kept pickup courts in the Seattle-Tacoma area, a vision compared to the weeds poking through the asphalt that Crawford played on 20 years ago, nervously calling “Next!” for a game with grown men and older teenagers. To remember that feeling, Crawford sometimes pulls up on warm summer nights, cuts the headlights, and watches the kids and men run for a while — before getting out and joining in the game. 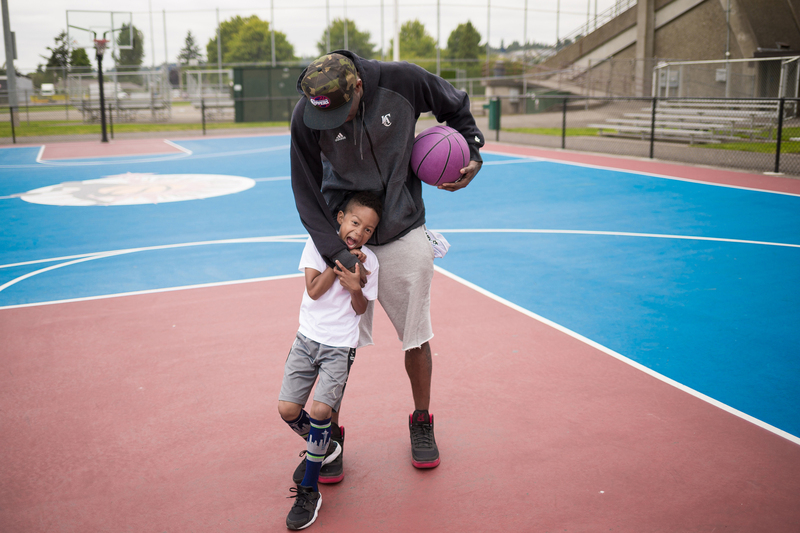 Jamal Crawford and son Jayen “JJ” Crawford, 6, hang out at the court where Jamal became a known figure in the Seattle basketball scene, now known as the Jamal Crawford Court in Liberty Park. After J.J. finally began making layups and then impressively dumping in 15-footers on the 10-foot basket, Crawford paused for maybe a minute. Looking beyond the chain-link fence, past the baseball diamond, he breathed deeply. “You know, I didn’t have the hardest life,” he finally said. “Most of the time anything went wrong, I had crafted it. So I had nobody to blame but me. A few minutes later, the wind picked up and the sky turned from blue to charcoal gray. The rain never came, but J.J. had his fill of playing on the court named for his father. As he ushered his son back to the car, tossed the ball in the back and closed the trunk, it becomes clear that Crawford has thrived this long in the NBA and in life not despite the bad choices he made but, really, because of them. This video was produced by Lois Nam.